Always use cream labeled “Heavy”, Whipping” or “Heavy Whipping” cream for best results and begin with the bowl and beater well chilled, along with the cream itself. Confectioners’ sugar actually has a bit of cornstarch added to it to help prevent clumping. 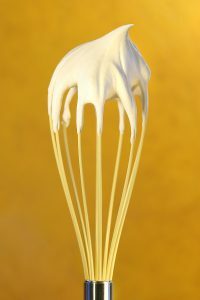 Used here, the cornstarch helps stabilize the finished whipped cream. Some people can detect a slightly “floury” flavor (from the cornstarch). You can certainly use granulated sugar, if you like. The recipe can be halved. In chilled bowl, beat cream, sugar and vanilla on medium-high speed with electric mixer, until very soft peaks form. (Use balloon whip if using a stand mixer). Lift the beaters to assess texture. The cream should come to a peak that softly curves over onto itself. (A stiff peak would stand up straight; at that point your cream is over-whipped. Note that is the picture the cream is smooth, glossy and the peak gently folds over to the side). TIP: When whipping cream for serving as an accompaniment or for incorporating into a recipe, it should almost always be whipped softly. Surely it is sometimes whipped a little more stiffly than others, but it will lose its textural appeal if it is ever whipped to the point of being stiff and it should never look lumpy or have a granular texture. If this happens, stir in some liquid cream to smooth it out, but best bet is to take care initially. 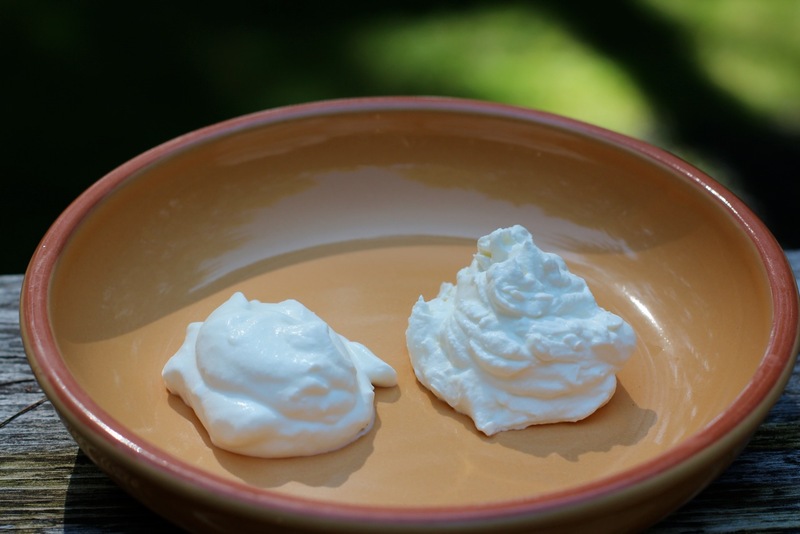 Below is a picture of softly whipped cream on the left and over-whipped cream on the right.